Ontario’s move to rapidly increase the minimum wage to $15 an hour is creating fear among Sarnia-Lambton small business owners uncertain how they can absorb the hit on their bottom line. “Do I make $15 dollars an hour? In the tough months? Are you kidding? I wish I did!” said Lori Mitchell, owner of Silhouettes Boutique in Sarnia. A 32% increase in Ontario’s minimum wage by 2019 is one of several changes contained in the Wynne government’s Fair Workplaces, Better Jobs bill currently in committee at Queen’s Park. But Bill 148, which some argue supports a living wage for Ontario’s lowest earners, will be a financial blow for many small businesses, owners say. 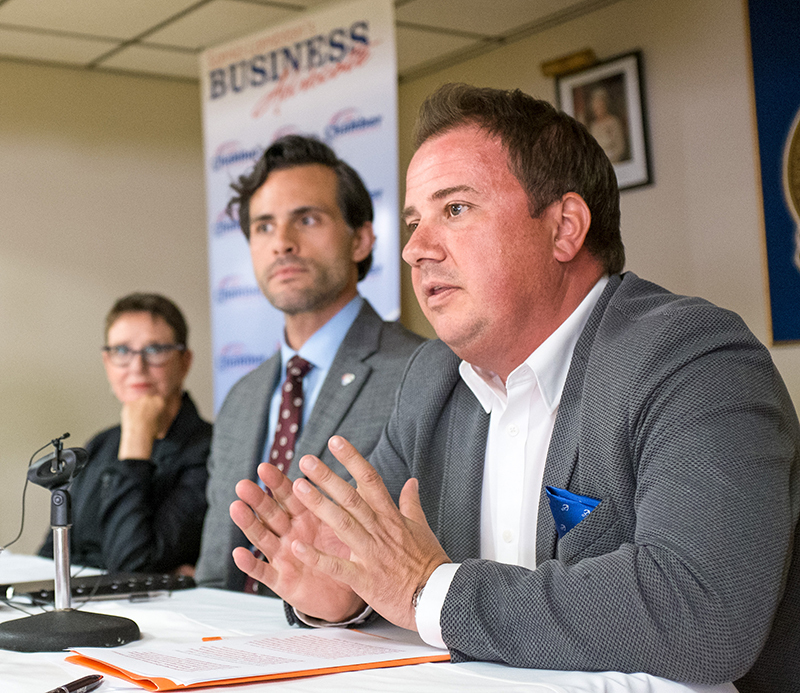 The Sarnia-Lambton Chamber of Commerce has taken a “too much, too fast” position and organized a town hall meeting in Sarnia last week to hear from the community. Many business owners, including Mitchell, say the wage increase will have to be passed on to customers. “All the way down the line everybody is going to be making $15 an hour. I’m not going to be making $15 an hour, I’m going to have to increase my prices,” Mitchell told about 75 in attendance at the Royal Canadian Legion Hall. Chamber president Shirley Da Silva acknowledged workers want a fair wage but said the rapid increase will burden businesses already struggling with soaring energy costs. “It’s such a great increase… and we really don’t know how that’s going to affect small businesses. And small businesses themselves don’t know how they’re going to manage on such a short time frame,” she said. The bill calls for the minimum wage to rise to $11.60 an hour by October, to $14 by January of 2018 and to $15 by January 2019. It would also impact vacation time, scheduling and unionization. Jason McMichael, president of the Sarnia & District Labour Council, said the increase would lift many “working poor” out of poverty. “Raising people out of poverty has never closed businesses. The very theory of this just isn’t sound,” he said. McMichael pointed out 57% of Canadian GDP is a result of regular household purchases, and that increasing the minimum wage will fall directly back into the local economy. “We all just want to make an honest living… whether you’re a barista, or you own a Starbucks,” he said. For more on the Fair Workplaces, Better Jobs bill, visit www.ontla.on.ca.